The other day I had the pleasure of talking with the folks at AstroHQ about being in the flow. It ended up being a fun conversation! Take a read on the Bicycle for the Mind. … make sure you’re using a real device. This error will be given if you try to complete a purchase in the Simulator. That’s right, although you can list purchases in the simulator, actually buying something with a Test user in the sandbox environment will simply fail with this vague error. I built a custom PCB to host a ATMega328P in DIP form factor. I want to control two stepper motors for a project. I considered doing it “the hard way” : E.g. using my own driver transistors and protection diodes… and I’ve also ready about a variety of silicon that makes driving them easy. But I’m still not ready to learn to do surface mount soldering, and I wasn’t finding any stepper motor drivers in DIP configuration. 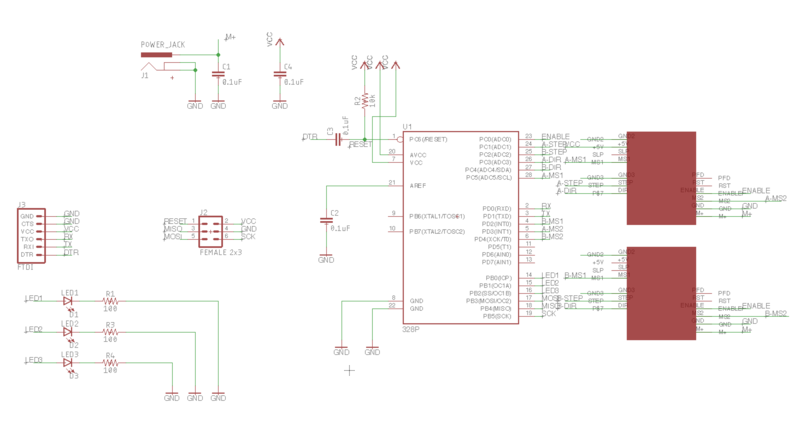 So I opted for something I’ve used on other projects, the “Easy Driver” from SparkFun. 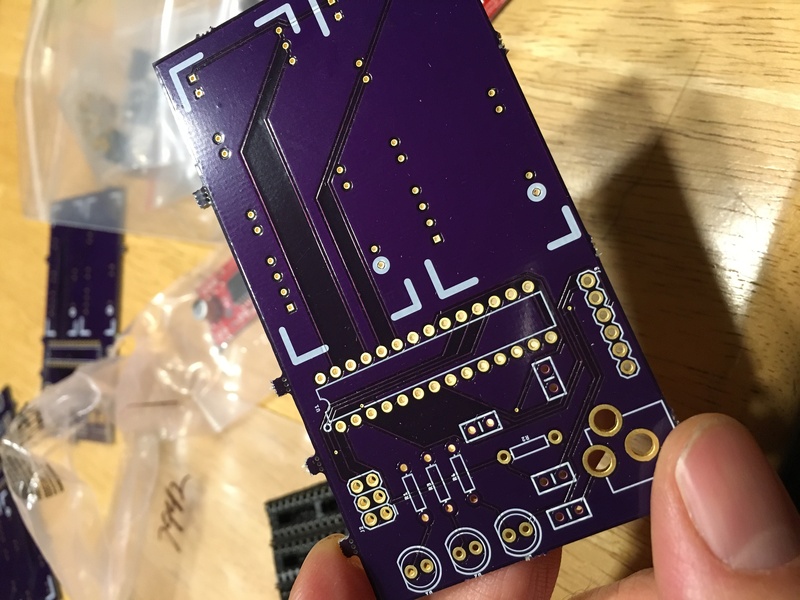 A few of the features of this PCB is the 6-pin header that allows for it to be programmed using the linux command-line tool avrdude. I found that avrdude runs on raspberry pi, and I have one unused in a drawer. My plan was to make it so I could slide the pcb right onto the GPIO of the pi. But I neglected to consider the height of the various components on the pi, so I had to opt for use wires to hook it up instead… Not elegant but functional. The wifi went out on my pi (which is why it is in a drawer). So I used a internet sharing on my mac to connect to it using a thunderbolt ethernet adaptor. 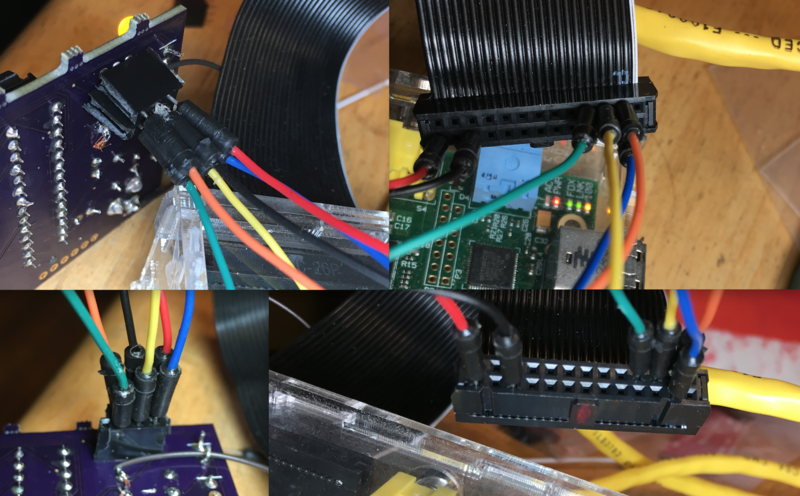 I ssh into the pi, and use avrdude to upload to the PCB with the ATMega328p. I have a simple makefile that compiles my “C” program using avr-gcc. It’s a beautiful board. I don’t think I’ll ever build something out of a generic perf board again. The vias for my Easy Driver were too small to use regular wire. But I had some resistors with thin enough leads I could use those. I’m sure I think of some others. But the fact that the thing actually drives a motor is kind of amazing…. We’ve adopted gitflow for one of our projects. The git command line tool integrations found on github are very handy. Note: be sure to adopt the -avh version of the tools found in this repo: gitflow for git on github. To install on Mac OS use `brew install git-flow-avh`. The non `-avh` version of this tool is 7 years out of date — we mistakenly used that version initially and ran into bugs that have been around for many years (and which are fixed in the `-avh` version). Have a Fantastic Halloween. 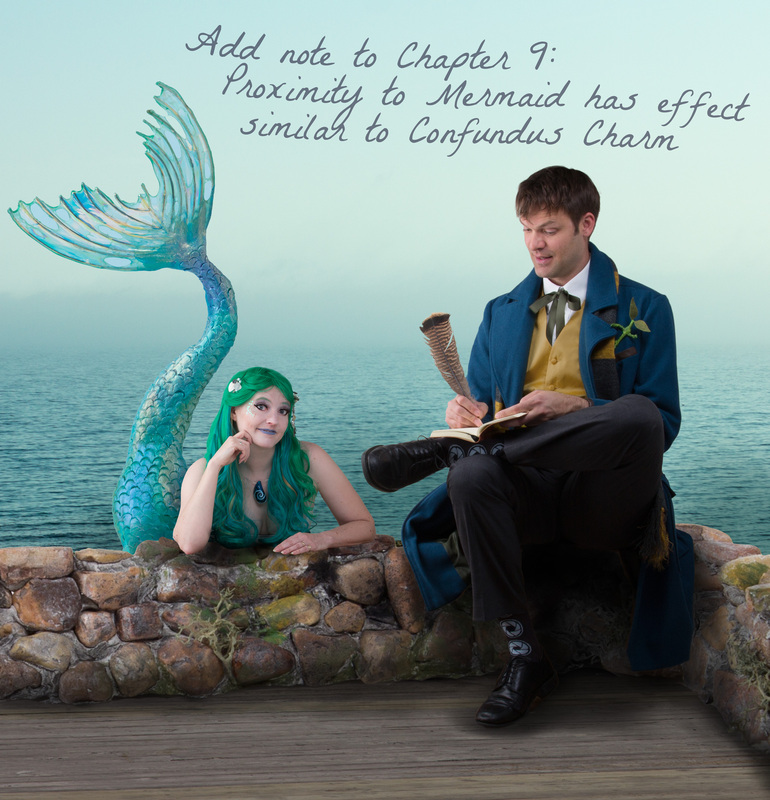 Don’t get eaten by any nasty Newts, Salamanders, or other Beasts! I’m working on some unit test in Java (well, Kotlin) for an Android project. When I set a breakpoint, the failure mode changes because there are timeouts and races going on. This is not an ideal situation, but I’m debugging someone else’s code here. So I found a clever way to log what code is getting called, and from where, by using breakpoint actions. 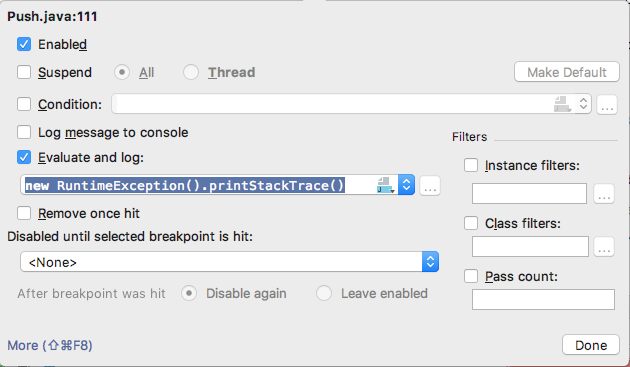 Just put `new RuntimeException().printStackTrace()` in as a breakpoint action! Now your log shows when code got hit, and why it got there, but doesn’t actually stop execution, so it does less intrusive shift to the timeouts and race-conditions. This has been a pretty major headache: Trying to validate a receipt for an in-app purchase on iOS. Now, to explore the contents of my ASN1 package! Edit: After writing this, I was helped by Andrey on Twitter and now I know about the return@ feature of Kotlin. I’ve also voted for an improvement that would make that feature more discoverable. Today’s kotlin frustration… trying to map a Bundle into types. E.g. if the bundle has the key “connected” get it out as a boolean. otherwise, skip the event. That’s probably obviously wrong to you now, but it took me a long time to see the problem. I don’t see why Kotlin disallows the return — and it makes this kind of error much less likely. The fact that closures evaluate to the last expression is handy for doing tiny bits of work, but I find that reactive networks in RxJava are much easier to express with blocks — and if they get more than a few lines long, you sometimes really want the ability to do an early return without introducing the nested scope of an `if` statement. So I installed openvpn on my Raspian distro on my Raspberry Pi 2. As soon as I started it up, I lost all connectivity to my Pi. And I don’t have a display, keyboard, or mouse — all my management has been over the network. I tried a bunch of things, but here’s what worked, in brief. Power off PI and put SD card in my Mac. Use Disk Utility to see which device is your card reader. The Pi’s SD card has two partitions, and the first can be mounted by your mac. Note by using ‘rdisk2’ instead of ‘disk2’ it does unbuffered reading which is faster, or so I’m told. Install VirtualBox with the latest Finnix Recovery Distro. Add the .vdi file created above to the Finnix VM. Failling that, you can always just remove all the init scripts that start openvpn. Put the SD card in your Raspberry Pi and reboot!